As described in the product overview of the Recommendation Service, it provides 4 separated steps to conveniently implement the data acquisition, processing, distribution and monitoring necessary to deliver recommendations for each user. Additionally to collecting information on the web pages, the consumption on the mobile applications should also be considered. PEACH has developed a simple to integrate library for iOS and Android which are available on the PEACH repository at https://git.ebu.io/pipe/pipe-ios for iOS and https://git.ebu.io/pipe/pipe_android for Android. Pipe Collect REST endpoints are hosted on a Python Flask web server. The pipe-collect API provides a batch ingest which collects several events within one API call. A broadcaster might prefer to collect event by batch for instance send event in a mobile app only when connected through a Wifi. 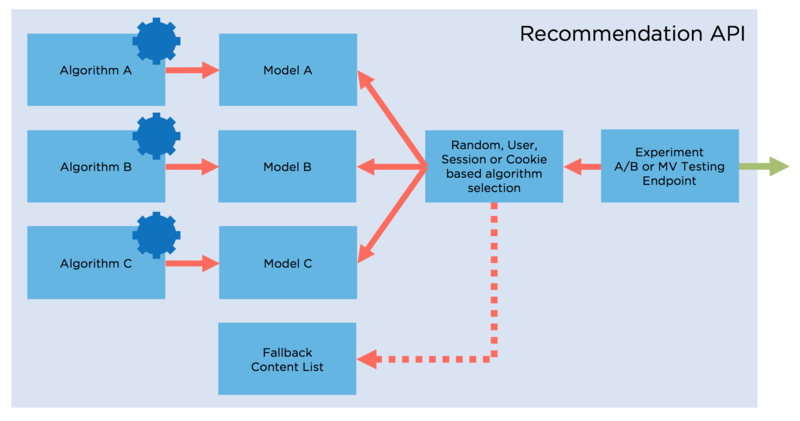 The second step in the recommendation process is described and integrated in the Data Scientist Platform. Mainly the part concerning the recommendation is the processing and computation of the algorithms to provide data to the recommendation API. Most of the operations and actions are handled within the management dashboard allowing the broadcaster to control the evaluation and distribution endpoints. 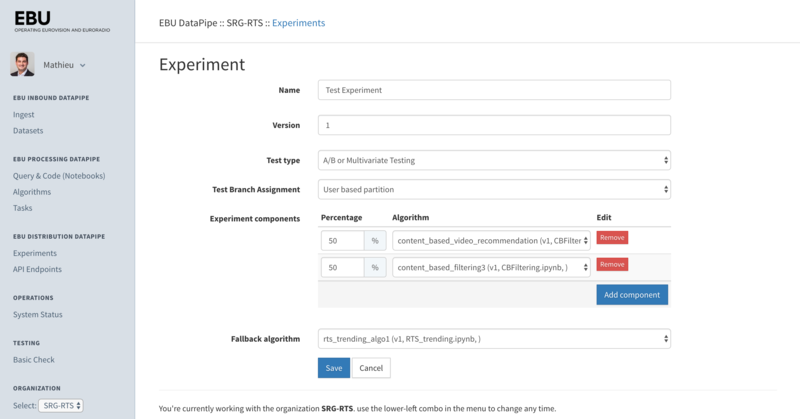 See the Introduction to Data Scientist Platform . The algorithms developed by the data scientists are converted into tasks that are run periodically on a Spark cluster and process the collected data in order to provided updated models for the recommendations. Once the models are computed they are made available through the Recommendation API. The endpoints provide a way to query and execute the computation necessary to build the list of recommendations given user id and, optionally, some additional parameters. This part uses the results of the previous task computation stored in Redis (i.e. the model). The way how the Recommendation API is queried depends on the implementation, in most cases, the broadcasters backend will query the Recommendation API and build a more elaborate list with metadata to be returned to a visitor. In some cases querying the Recommendation API directly from the visitors devices or browser may also work if limited or no metadata is available. Additionally a list of content can be placed on a CDN to work as a fallback in case the Recommendation API experiences issues and does not return in proper time. The recommendations are made available through API endpoints on the Recommendation API hosted on a Python Flask web server. The Recommendation API usually receives additional query data such as user ids or cookie information. Recommendation Lists usually need to be extended with metadata as they return only content ids, thus most implementation they are queried through the broadcasters backend that will add the necessary metadata of the contents. However the infrastructure is build to support direct query as well. The ecosystem made available to data scientists provides tools to compute and store periodically update lists directly to CDN infrastructures to be used as a static fallback option. Measuring and improving algorithm requires an A/B or Multi-Variate Testing environment. The Recommendation API and the management interface offer these options. The evaluation of the recommendation follows the workflow below. Based on the configuration of the experiment, a Model is selected to a request based on the user'd id, its cookies or randomly. This allows a consistent research and testing framework for data scientists. Additionally if the Model computation does not return a consistent list another fallback list can be chosen to overcome cold start and other common issues or recommendations.